I'm so glad you're cute... because today you have not been so cute! But we are not going to dwell on that tonight. We are going to dwell on the cuteness that is Cory! 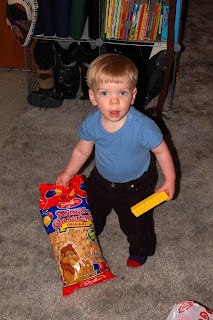 Exhibit A: Cory finds the animal crackers we have just bought at the store. 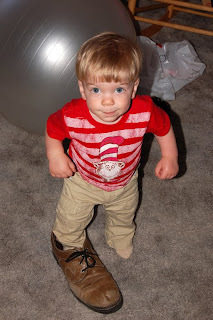 Exhibit B: Cory finds that the closet has been left open, brings out one of Daddy's shoes, and tries to step into it. I help him and then take a picture! Exhibit C: Cory makes a new friend of my parents puppy, Cayenne. 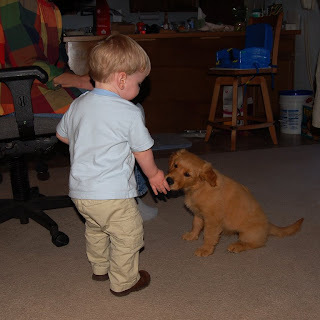 Mom gave him bits of puppy chow and he was feeding the puppy right out of his hand. Darn cute! 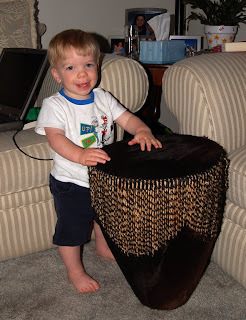 Exhibit E: Cory finds the drum that Auntie Allison brought us from Africa before he was born. I have been thinking for the last couple months that we need to get him a drum... totally forgetting that we already had a real one! Oh and by the way? Today I went to book our plane tickets to Saudi Arabia next March using frequent flier miles. A round trip ticket on any of the major airlines is running around $1,800 (including on Air France). So I booked through Northwest and the trip includes one leg each on Northwest, KLM, and Air France. Then I had to call in to add Cory to the itinerary, fully expecting to pay $300 - $400 in taxes for him even though he would be sitting on our laps. After 45 minutes on hold (no, I'm not kidding, that's how long it took them to figure this out) they quoted me $1400 for him. ON MY LAP. And if I wanted to buy him his own ticket/seat on our same itinerary? The reason for this? On our return flight the only option with miles was to go to Amsterdam, back to Paris, and then home on Air France. That little Air France option was going to cost us $700 alone for Cory. All the other sections combined were $600. LAME! I called back later and got a different quote of $900 for the whole flight - and checked to see if there were any other options for our tickets that would avoid AF (of course not). The attendant told me that AF doesn't give infant discounts even if they're in the lap and because we have that one segment with them... we are basically screwed. 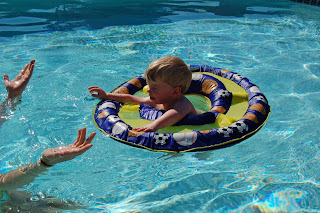 You are SO BRAVE to take a 2 year old on that long of a flight! Is this just a vacation? Hi from Kampala. So sorry to hear about the extra charge for Cory. I guess it's a blessing that you could get the ticket at all-- and I hope they'll at least give you the bulkhead seats (this may be why they charge more, because they consider those premium seats, though it's still lame)I guess theoretically you could take the train from Amsterdam to Paris, but that would just be extra time and trouble (and probably not save you that much money in the end). Ha ha, ask my mom about making those trips with twins! It does blow my mind. Love the pictures of Cory... esp him and the drum! wow you're going to SA? why? I love those pictures of Cory. He's at the age he can stay one step ahead of you! How Much Does It Cost You To Eat?